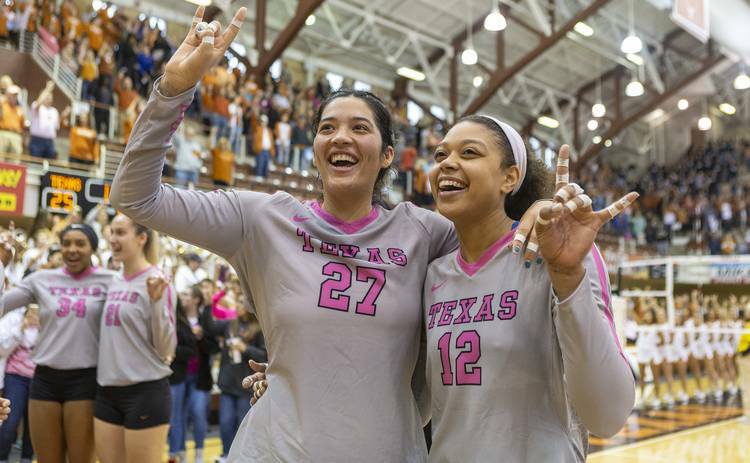 Senior day is here, but Longhorns could get postseason matches at Gregory Gym. Four-year teammates have strong bonds on and off court. They will face West Virginia on Saturday in the regular-season finale. Front and center in this scene will be outside hitter Yaazie Bedart-Ghani and middle blocker Morgan Johnson. The only seniors on UT’s roster will embrace while putting their Horns up. Bedart-Ghani will probably use her right hand while Johnson raises her left. This has been Bedart-Ghani and Johnson’s postgame routine since they arrived on campus. And as UT’s volleyball season approaches its final stretch, it is also a routine that is nearing its end. Bedart-Ghani and Johnson’s friendship was founded back in 2014 when the future Longhorns met at an Under Armour All-America showcase that also featured UT junior Micaya White. (White would redshirt as a freshman in 2015 with a leg injury.) White and Johnson are products of the Dallas area and the same club program, but Texas had Johnson and Bedart-Ghani room together during their freshman year. That living arrangement gave the Longhorns their own version of the Odd Couple. Ask a Longhorn to describe Johnson, and the word “goofy” might be used. Bedart-Ghani has a more serious demeanor. A proud Californian, Bedart-Ghani prefers hamburgers from In-N-Out. DeSoto-raised, Johnson opts for Whataburger. Johnson characterized herself as the loud roommate who is prone to playing her music and chatting on the phone. As for who is messier, Bedart-Ghani said both parties were guilty of turning dirty dishes into a staring contest. Former team manager Kevin Inlow once asked a question that elicited a “Shining”-like answer. On the court, Bedart-Ghani and Johnson’s bond has helped lead Texas to 103 wins and two appearances in the NCAA’s championship match. Johnson will exit Texas as one of the program’s all-time leaders in blocks per set and hitting percentage. A two-year captain, Bedart-Ghani has squeezed playing three different positions and a handful of big moments in the NCAA Tournament into her time at Texas. This year, Johnson is averaging 1.79 kills and 1.05 blocks per set. Slowed by a back injury at the start of the season, a healthy Bedart-Ghani is contributing 2.5 kills per set. Her .351 hitting percentage ranks fourth in the Big 12. Texas has compiled a 19-4 record this fall. Last week, the Longhorns secured their seventh conference championship in the past eight years. Ranked fifth in the AVCA’s national poll, Texas will host the first two rounds of the NCAA Tournament next week. Thanks to an unexpected loss by No. 1 BYU on Tuesday, UT remains in contention for a top-four seed in the postseason. If they snag a top-four seed Sunday, the Longhorns could play up to four more matches at Gregory Gym.